In 1961 more than half of all deaths in the UK were due to diseases that affect the heart and circulation (cardiovascular disease). Improvement in the tr eatment of cardiovascular disease, such as lipid lowering therapies and new surgical interventions, have reduced this number by over three quarters. However, cardiovascular disease still accounts for more than a quarter of all deaths in the UK hence there is a pressing need to identify new treatments. Large population based studies comparing the DNA from healthy individuals with those who have cardiovascular disease have enabled us to identify new genes that have a role in this disease for the first time. We are interested in new genes which have no known function as these genes have the potential to identify new ways to prevent or treat coronary artery disease. In my talk, I will walk you through the process we have used at the University of Oxford to identify candidate genes for cardiovascular disease from large genetic population studies and how we validated these findings using cell and animal models. 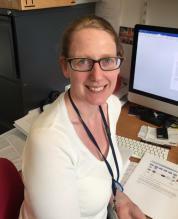 Gillian Douglas is a University Research Lecturer at the University of Oxford in the Division of Cardiovascular Medicine; she is also a Lecturer in Physiology and Pharmacology at Jesus College, Oxford. Coming from Glasgow, which has one of the highest incidences of cardiovascular disease in the country, Gillian has always had an interest in the mechanism behind this condition. She is currently working on understanding how two genes of previous unknown function affect the development of atherosclerosis (ie when arteries become clogged with fatty substances called plaque or atheroma).